This is the tale of a colossal fail and a fantastic success. I tried to make the first version with gluten free biscuits. However, they ended up tough and it just wasn’t what I was hoping for. 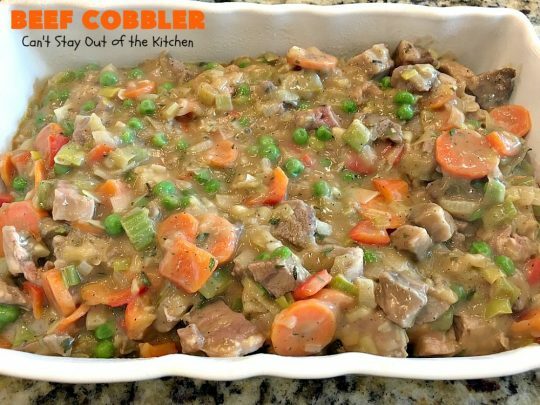 I served it for our Friday night care group, and was so saddened when it didn’t turn out as well as I would have liked. But thankfully, someone else had brought Chicken Tortilla Soup that night so we didn’t go hungry! My second version of this recipe turned out a lot better than the first! This time the recipe came together like clockwork and turned out great. While I don’t eat a lot of gluten these days, I do splurge every now and then. This was one of those occasions when I splurged. I had made Prime Rib Roast for Thanksgiving and again in December last year. 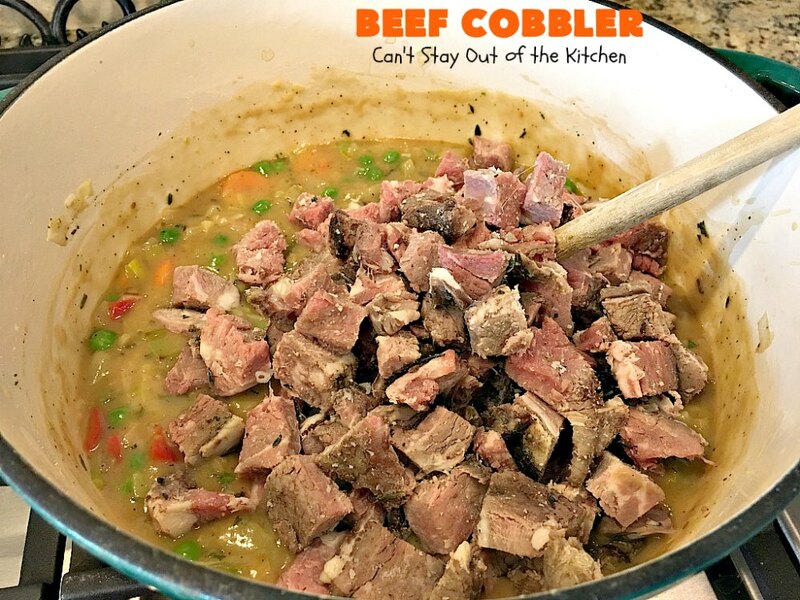 I had some leftover meat that I needed to use up and that’s when this recipe was born. I seasoned the beef filling with some of my favorite herbs: thyme, marjoram and parsley. Then added Liquid Smoke to give it that kick it needed. 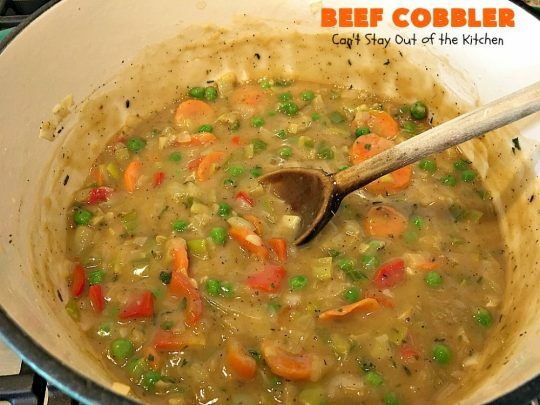 I tossed in lots of veggies like carrots, peas, bell peppers, onion, garlic, leeks and celery to provide flavor and vitamins. I topped it all with melt-in-your-mouth cheesy biscuits. (Yes, I was in seventh heaven). This beef entree is so comforting during cold, winter nights. 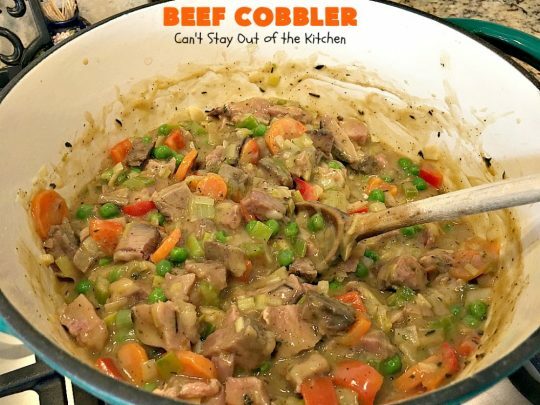 Every bite of Beef Cobbler will have you salivating. This biscuits are amazing too. They’re filled with cheddar cheese, garlic powder, thyme, parsley and chives. The amped up flavors turn dull, lifeless biscuits into sensational! 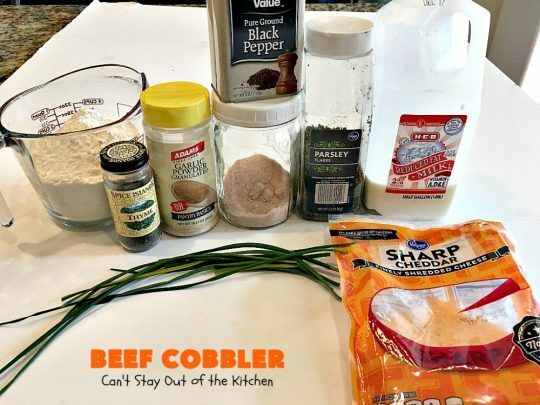 I used these ingredients to make the beef filling. The mason jar contains pink Himalayan sea salt. The measuring cup contains unbleached flour. 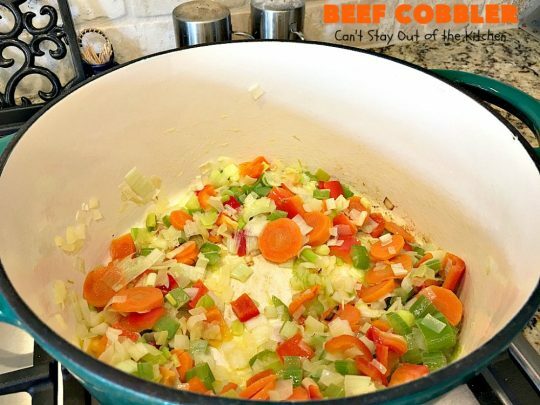 Melt butter in a large enameled cast iron Dutch Oven. (I love enameled cast iron. It’s my favorite surface to cook in.) 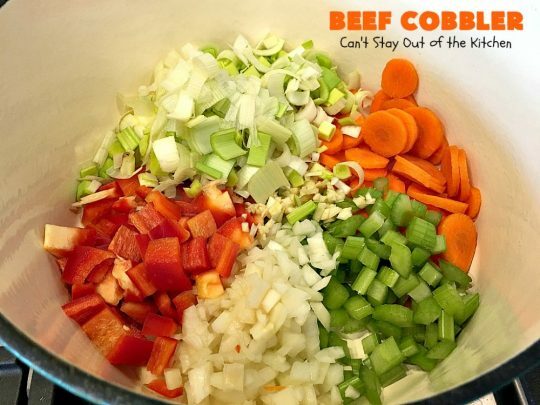 Add carrots, celery, onions, red bell pepper, leeks and garlic. Saute about 10 minutes until carrots are fork tender. Add peas. Stir to combine. 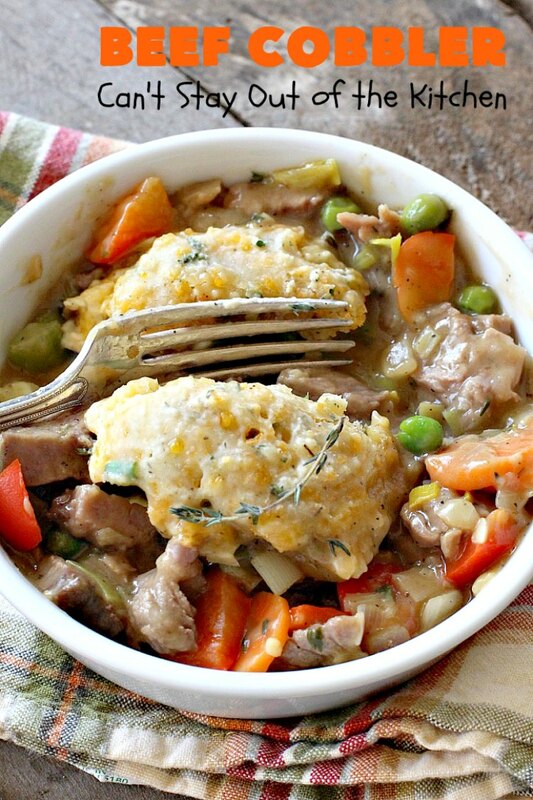 Sprinkle flour over top of veggies. Stir to combine and allow to cook about 1-2 minutes. Add pink Himalayan sea salt, pepper, marjoram, parsley and thyme. Add Liquid Smoke. Stir to combine and heat through about 5 minutes until mixture thickens. Stir continuously. 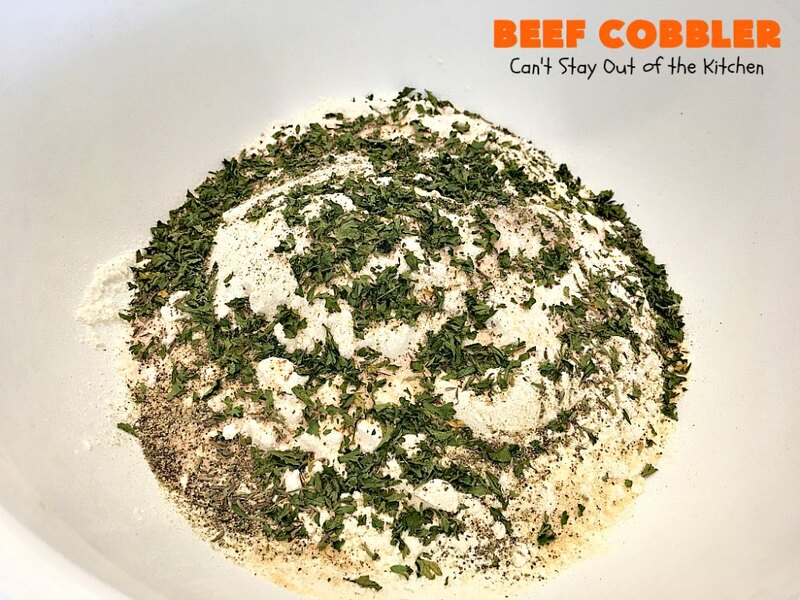 Add beef. I used leftover Prime Rib. But leftover steak or pot roast is perfectly fine here too. Grease an 8×12″ glass baking dish. 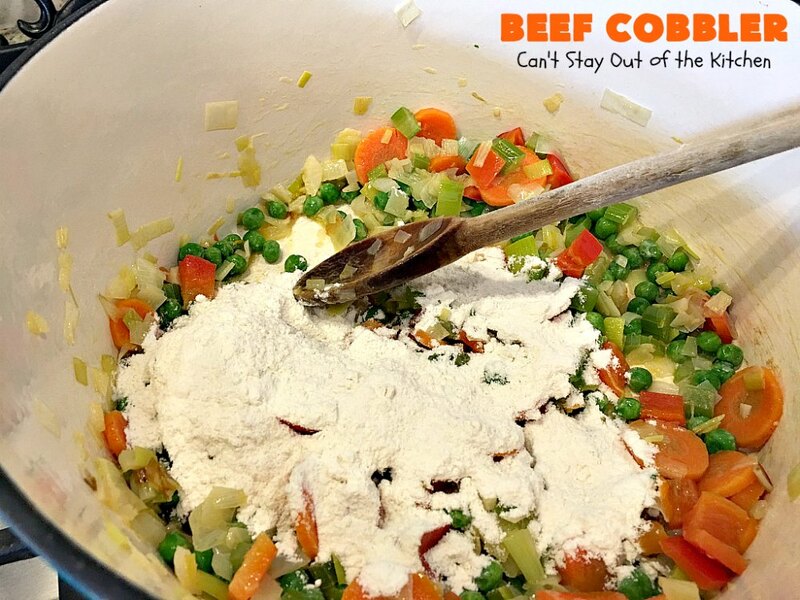 Add beef mixture. Set aside while preparing biscuits. I used these ingredients to make the biscuits. 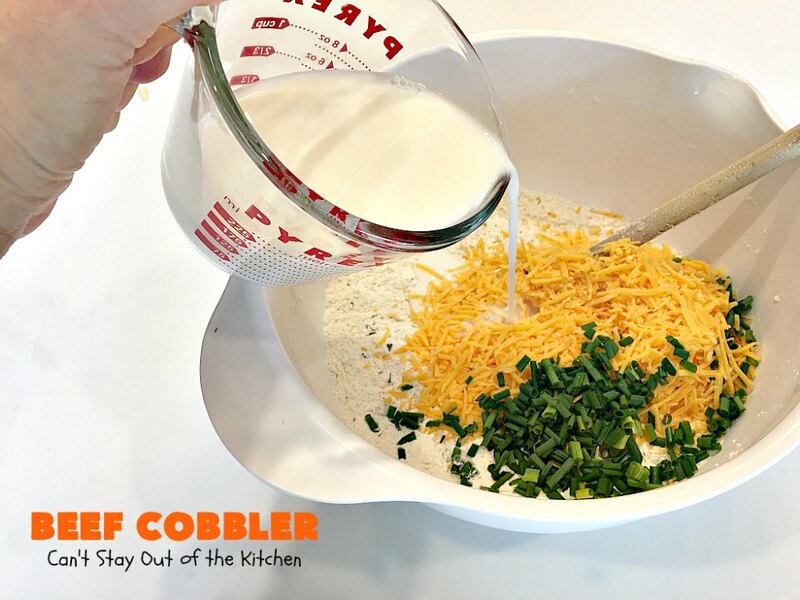 Place flour in a mixing bowl. Add pink Himalayan sea salt, pepper, garlic powder, thyme and parsley. Stir ingredients to combine. Add cheddar cheese, fresh snipped chives and 2% milk. 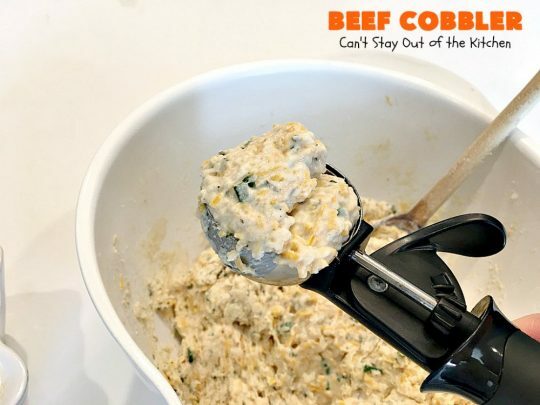 With a large 1/4 cup cookie scoop, scoop biscuit mixture. Place biscuit mixture on top of beef filling. I actually had enough biscuit mixture to make 14 biscuits so I cooked the other two biscuits separately. 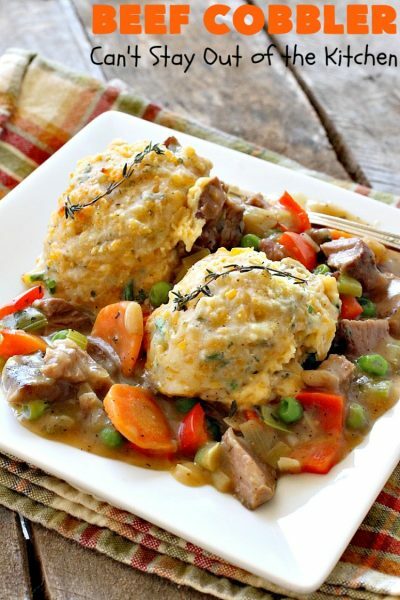 Bake at 400 degrees for 18-23 minutes or until biscuits are golden brown and cooked through. I insert a toothpick in one down to the bottom of the biscuit to see if the dough is cooked through or still doughy. Beef Cobbler is one of those foods you can never get enough of. 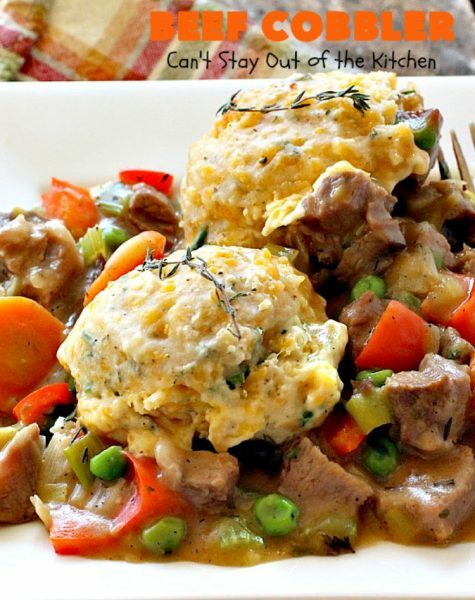 If you enjoy biscuits and beef pot pie, you’ll love this terrific recipe. 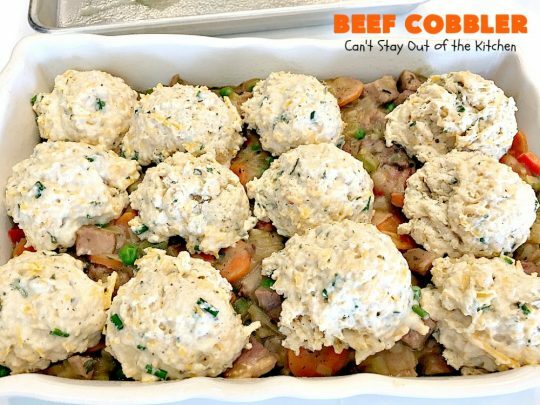 Your family will love eating Beef Cobbler on Saturday nights after a hectic day at sporting events with kids. 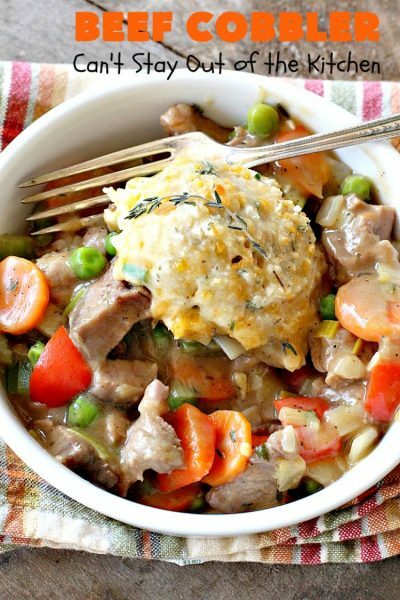 Beef Cobbler is hearty, filling and so, so satisfying. 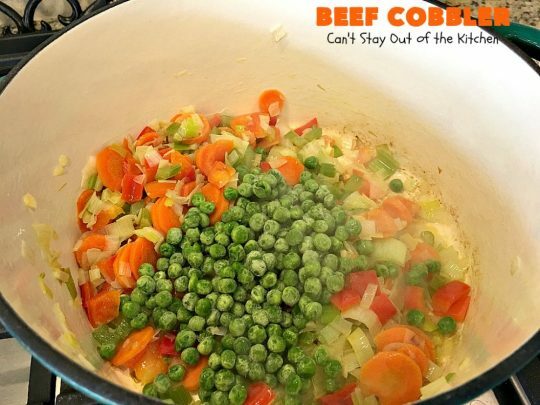 This fantastic beef pot pie recipe is filled with leftover roast beef, peas, carrots & other veggies. 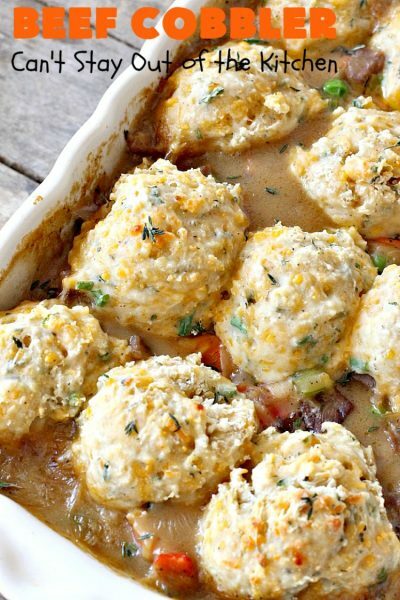 It's topped with amazing melt-in-your-mouth cheesy biscuits. 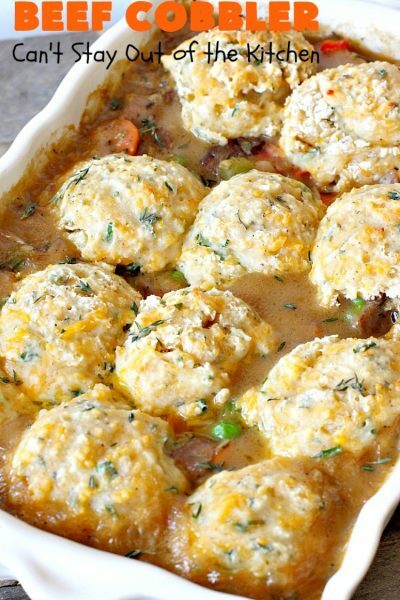 Perfect comfort food for fall or winter nights. In a Dutch oven, melt butter over low to medium heat. Add carrots, celery, bell pepper, garlic, onion and leeks. Sauté until tender, about 10 minutes or when carrots are about fork tender. 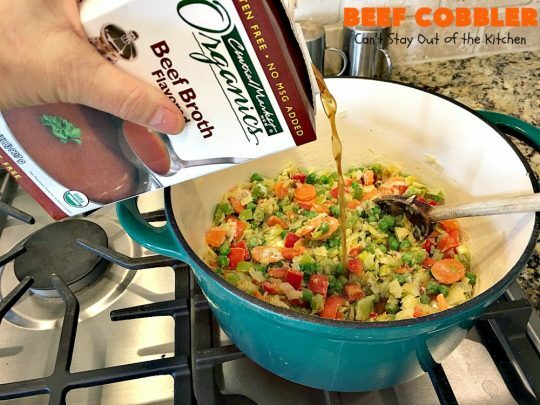 Sprinkle flour over top of veggies and stir to combine. Add beef broth or stock, thyme, marjoram, liquid smoke, salt and pepper and slowly until incorporated. 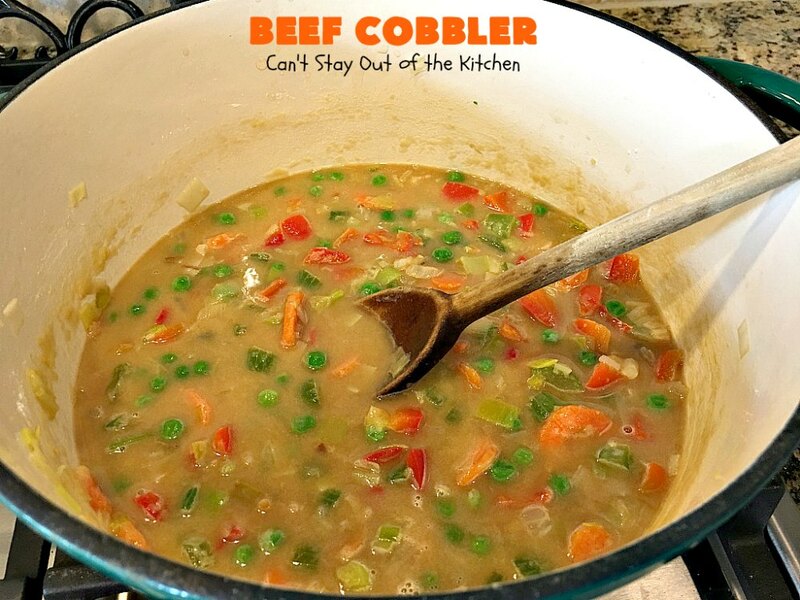 Cook until thickened—about 5 minutes. Pour beef mixture into prepared dish. 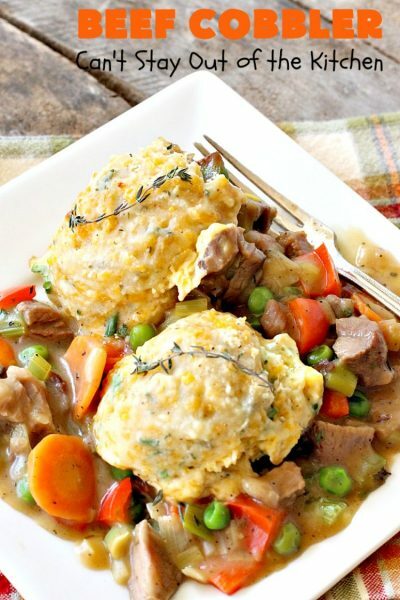 Top with dollops of biscuit dough. 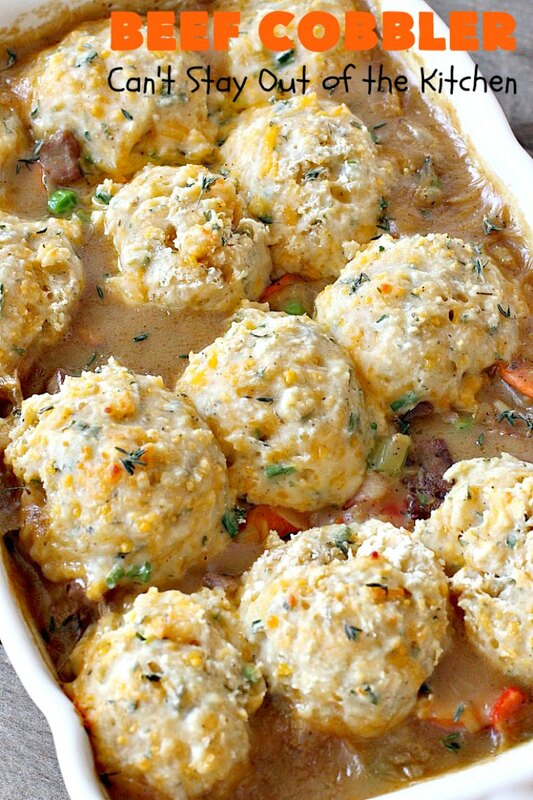 Bake at 400° for 18-23 minutes or until biscuits are cooked through and biscuits are golden brown. 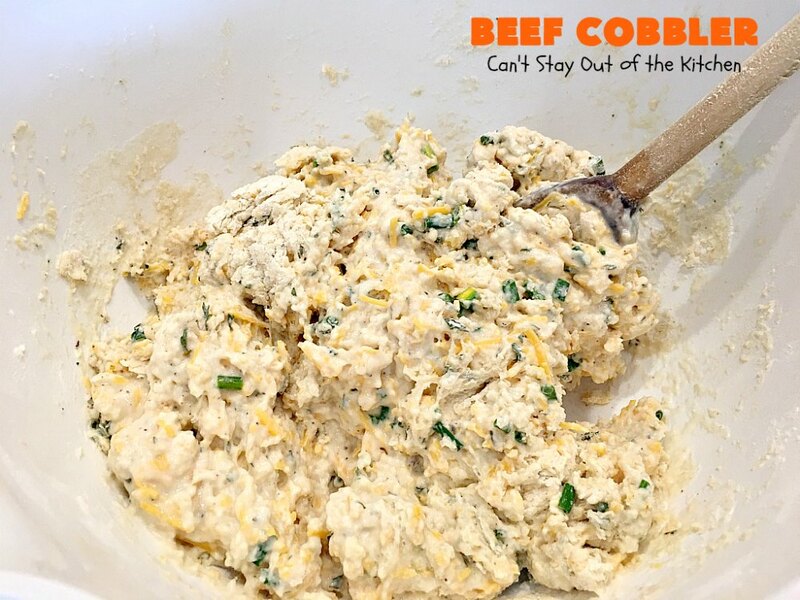 In a large bowl, combine flour, baking powder, garlic powder, salt, pepper, thyme, parsley, chives, cheese and milk. Dollop biscuit dough with a large spoon or cookie scoop on top of the beef mixture. NOTE: Your biscuits may take longer to cook if you have a slower oven. NOTE: Insert a toothpick down to the bottom of the biscuit to check doneness. 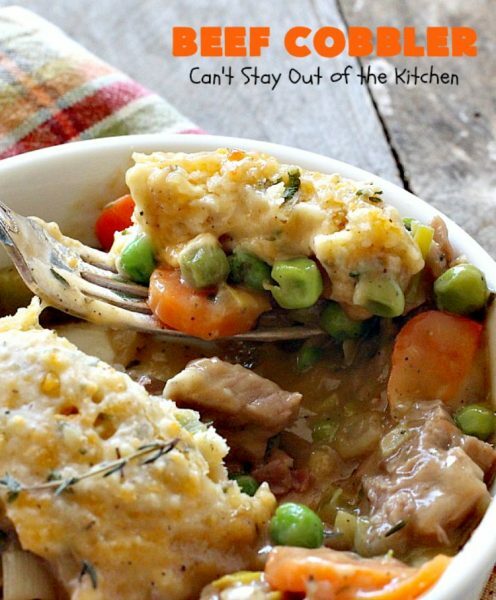 If biscuit seems doughy, cook longer. NOTE:I think I used self-rising flour when I made this the first time and that's why I didn't include baking powder in the recipe. Unless you use self-rising flour you will need to add two teaspoons baking powder for the biscuits to raise properly. 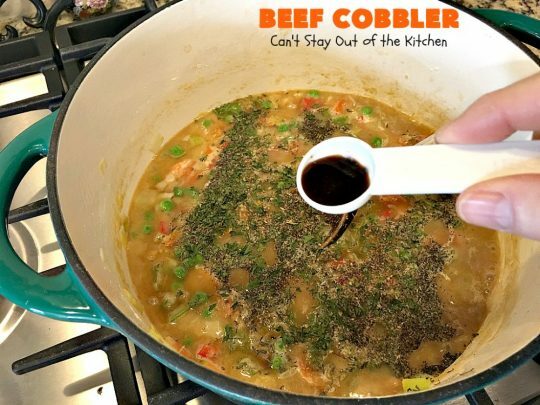 You can use leftover roast beef, steak or prime rib in this recipe. I love cheesy biscuits and these are wonderful. 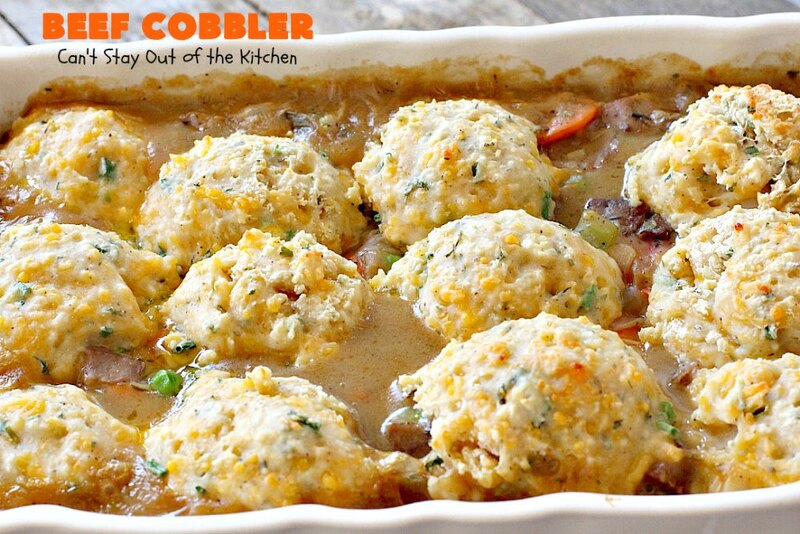 You may enjoy these delicious recipes! Biscuits are terrible. Against my better judgement I didn’t add baking powder and I should have. Hockey pucks on top of a great tasting beef/veggie base were not great. I will try again, but I will make the biscuits more like baking powder biscuits. Sorry you didn’t enjoy them, Brenda. Are you sure you don’t need baking powder in the biscuits? I’ve not heard of biscuits that don’t. Hi Lee. I know it sounds crazy but I’m pretty sure I didn’t use it. But if you feel better about it, you can always add a teaspoon or two to the batter. 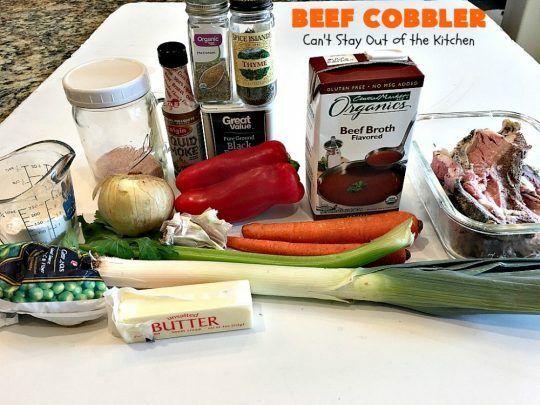 I’m making this tonight, and I just realized that the recipe doesn’t specify how much beef broth. The whole container? Hi, Jill. I am so sorry I didn’t see this before you made it. The recipe uses 16-ounces of beef broth. I’ve corrected the recipe now. Thanks for catching this error. Again, I’m sorry and I hope yours turned out okay. Thanks, Carol. Hope you enjoy it.